An epiretinal membrane, also known as a macular pucker, is a thin layer of scar tissue that forms over the macula, the center part of the retina that is located at the back of the eye. The macula is the area of the retina that provides clear, sharp central vision. 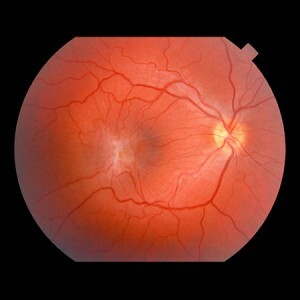 An epiretinal membrane often develops as part of the natural aging process. The vitreous gel, which makes up most of the eye's volume, begins to thin and pull away from the retina. As a result, damage is caused to the retina and leads to the formation of scar tissue on the retina. When the scar tissue contracts, the retina wrinkles, or puckers, causing blurry or distorted central vision. Most cases of an epiretinal membrane do not progress and do not require treatment. The symptoms of distortion and blurriness are usually mild and patients are able to adjust to the vision changes without much impact on their daily lives. Noninvasive treatments such as eye drops or medications will not improve vision that is distorted from an epiretinal membrane. If visual distortion is severe, a vitrectomy may be performed to repair this condition. During a vitrectomy the vitreous humor is removed from the eye followed by the scar tissue. This allows the macula to flatten out into a more normal configuration.